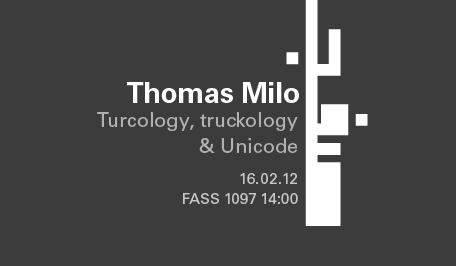 In this lecture Thomas Milo will weave together several threads that appear unconnected. Language studies, travel, transport, soldiering, graphic design and technology. There is the irony that the Cold War, a period of extreme mutual East-West intimidation, paradoxically led to relative stability that made it safe to travel by road from Europe to Pakistan. And there is the irony that today's multi-lingual global computing is deeply rooted in exclusively English-based monolingual preparations for an East-West Hot War that would have led to Mutually Assured Destruction, at better known the time as MAD. Inadvertently, out of Anglo-Saxon provincialism a novel approach to global communication emerged. There is the well-known infrastructure by the name of World-Wide-Web on the one hand, but on the other hand the little known live-blood of global computing: the Unicode Standard for text encoding that enables the use of Turkish, Russian, Chinese, Arabic, and many more languages and scripts in data traffic. This lecture is interesting for people who want to learn about history, IT, graphic design and Turkey. Thomas Milo is an independent scholar with a background in Slavic and Turkic studies. He is the author of Brill Publishers' new Qurʾān Concordance (part of the Encyclopaedia of the Qurʾān). As a reserve captain in the Royal Netherlands Army he completed two tours of duty in Lebanon, where he was a member of the battalion staff acting as combat interpreter Arabic, field negotiator and political adviser. He is also partner in DecoType - linguistic experts & designers of computer typography - a team that has been working on Arabic script technology since 1982. They pioneered the concept of Dynamic Font (Smart Font, Intelligent Font), a key aspect of all modern computer typography. Besides, he is among others consultant for Basis Technology in Cambridge, MA, for their Arabic and Persian Technology projects. Together with the École de Technologie Superieure and McGill University in Montréal Tom works on script recognition for Ottoman documents. In 2009 Tom received on behalf of DecoType the Dr Peter Karow Award in recognition of his fundamental contribution for computer typography. He also holds a Unicode Bulldog Award - whenever he remembers where he put it.